For eighteen months after losing my husband to cancer, I followed the traditional advice from experts. I over-achieved at being a dutiful student. I ate well—a poster-adult for Whole Foods. I slept 8-10 hours a night—more than I had slept since early childhood. And I exercised—bicycling 120 miles and taking 3 Pilates classes weekly. It failed. My life remained in shambles. I was miserable! Frustrated I was ready to do the most opposite thing I could think of from all of this sage advice. I was ripe for rebellion. If I headed off on a trail of my own making, at least my tracks would be my own and not sloppy indentations from trying to step carefully inside someone else’s footprints. That’s how my rebellious decision to join a group of seasoned motorcyclists on a 10-day trip down America’s northwest coast was birthed. I knew my unorthodox plan was laden with risk and held potential for failure. After all, I didn’t know how to ride a motorcycle and had only thirty days to learn. But it offered a vacation. A respite from all of my doing, doing, doing to rebuild life. It was my delightful escape. 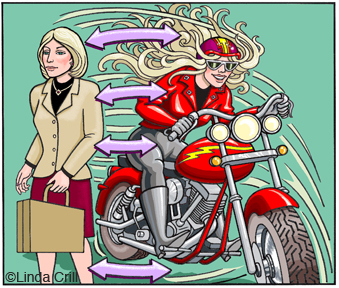 The realities of my impulsive decision quickly settled in as I walked into the Harley Dealership to take their 3-day learn-to-ride course. In the middle of the showroom I froze in front of a fully loaded touring motorcycle, overwhelmed by its size, weight, and complexity. How am I supposed to learn to ride this in just three days, I silently wailed? In spite the many setbacks in learning to ride, I felt I couldn’t quit. I had shocked everyone with my rebellious plan. If I backed out, I would have to admit I was wrong and return to a life that wasn’t working. More of the same would produce more of the same. So my rebellion became my motivation for continuing. On the 2,500-mile road trip I often felt overwhelmed as I explored a foreign way of being laced with failure, self-doubt and surrender. But there was also expansion, excitement, success and triumphant joy. I never would have believed that the way for me to rebuild my life was to choose a difficult, if not almost insurmountable goal; fail multiple times along the road before achieving it; and then be rewarded by success and a new self-sufficiency. On the road trip I confronted my fears and learned that once again I could trust myself to handle anything that life created. • Provides motivation for continuing on a difficult course of action. So when traditional advice fails, don’t copy teens by rolling your eyes upward, huffing, and then tilting your head sideways in disgust. Instead rebel like an adult. Skip the attitude and go directly to creating your own trail of footsteps. It may become your pathway to a whole new way of being.